I recently discussed this intriguing manuscript (see transcription at end of post) during a public talk at the Congregational Library in Boston. 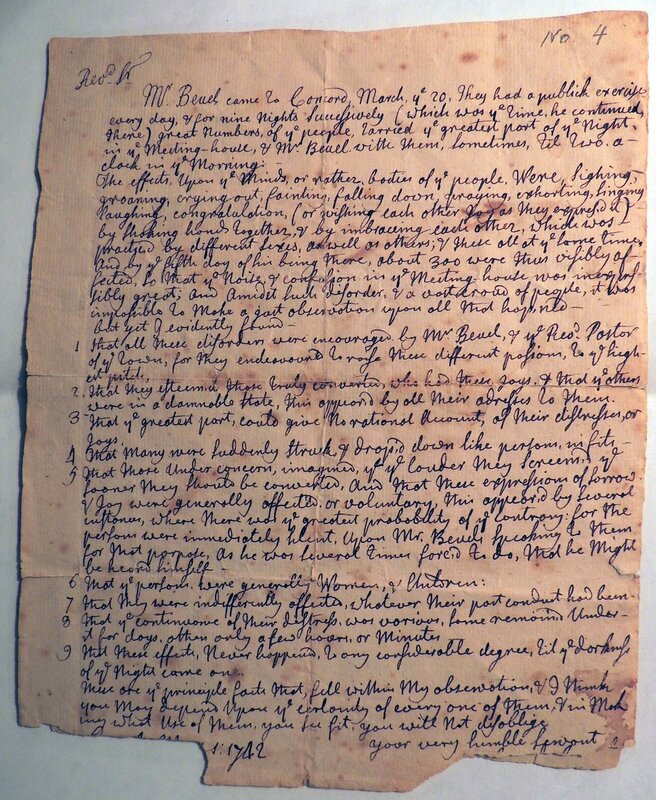 Written by an unknown layman to an unspecified minister, the short missive provides a detailed description of religious events in the town of Concord, Massachusetts, in March 1742. The letter is noteworthy for its commentary on the somatic manifestations that attended the Whitefieldian revivals in New England. Students of American religious history have long been familiar with the so-called “bodily exercises” of the Second Great Awakening—the fits of falling, laughing, barking, and jerking that dominated accounts of frontier camp meetings and sacramental festivals during the first decade of the nineteenth century. I’ve been tracking the most notorious of these innovative practices—the jerks—in my current research. But what about the Whitefieldian revivals of the mid-eighteenth century? What role did exercised bodies play during this earlier period? Samuel Buell (1716–1798), the central figure in the letter, is one of the least understood, but perhaps most influential figures of New England’s era of great awakenings. Born in Coventry, Connecticut, he graduated from Yale College and was licensed to preach by the East Fairfield ministerial association in 1741. Never as popular as George Whitefield or Jonathan Edwards, Buell was neither as controversial as Gilbert Tennent or James Davenport nor as skilled in polemics as Andrew Croswell. And unlike other prominent Whitefieldarians, including Daniel Rogers and Eleazar Wheelock, Buell did not chronicle his extensive itinerant labors in a journal. But during the peak months of the New England revivals, the “famous Mr. Buell” ranked among the foremost evangelists of his generation. The meetings in Concord were part of a nine-month itinerant tour that carried the young firebrand more than 300 miles from Connecticut to Maine. Buell’s barnstorming circuit began in Northampton, Massachusetts, in March 1742, where his potent sermons famously propelled Sarah Edwards to heights of mystical ecstasy. From there, he set off through the sparsely settled villages of central Massachusetts, preaching daily with “great power.” After pausing for a fortnight in Concord, he journeyed to Charlestown and Boston, where he teamed up with fellow itinerants Andrew Croswell and Daniel Rogers. By mid-summer, he had reached Falmouth, Maine. 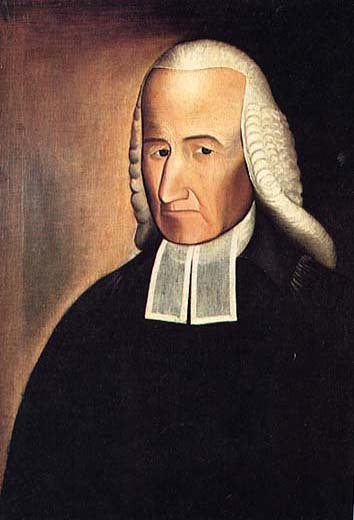 Abraham G. D. Tuthill, Reverend Samuel Buell, 1798, oil on canvas, Brooklyn Historical Society, New York. Following his return to Connecticut during the fall of 1742, Buell was ordained as an itinerant preacher with no settled pastorate—the second such figure in the history of New England Congregationalism. While traveling to preach in Virginia several years later, he was called to the pulpit of Easthampton, New York. Buell remained on Long Island for the next three decades. He achieved enduring fame during a powerful revival that struck the region in 1764 and emerged as a stalwart supporter of the Mohegan Indian minister, Samson Occom. The anonymous letter reproduced below may be found in Jonas Bowen Clarke’s Collection of Papers, 1742, at the Congregational Library in Boston and is reproduced by permission. For a brief biography of Samuel Buell, see Franklin Bowditch Dexter, Biographical Sketches of the Graduates of Yale College: With Annals of the College History, 6 vols. (New York, 1885–1912), 1:664–669. Additional accounts of Buell’s 1742 itinerant tour of New England include Sue Lane McCulley and Dorothy Z. Baker, ed., The Silent and Soft Communion: The Spiritual Narratives of Sarah Pierpont Edwards and Sarah Prince Gill (Knoxville, Tenn., 2005), 4–8, 11, 14–15; Samuel Hopkins, journal, 1741–1744, 27–34, box 322, Simon Gratz Autograph Collections, 1518–1925, Collection 250B, Historical Society of Pennsylvania, Philadelphia; Joseph Tracy, The Great Awakening: A History of the Revival of Religion in the Time of Edwards and Whitefield (1842; Edinburgh, 1976), 206; Boston Weekly Post-Boy, April 5, 1742; “Extracts from the Interleaved Almanacs of Nathan Bowen, 1742–1799,” Essex Institute Historical Collections 91 (1955): 167–171; Daniel Rogers, diary, 1740–175, April 1–April 29, 1742, Rogers Family Papers, 1614–1950, Ser. II, box 5B, New-York Historical Society; William Kidder, [ed. ], “The Diary of Nicholas Gilman” (M.A. thesis, University of New Hampshire, 1972), 279–281; and William Willis, Journals of the Rev. Thomas Smith, and the Rev. Samuel Deane (Portland, Maine, 1849), 103. I discuss the Buell’s itinerant career in Darkness Falls on the Land of Light, 220–230; see also Thomas S. Kidd, The Great Awakening: The Roots of Evangelical Christianity in Colonial America (New Haven, Conn., 2007), 134–137, 267–287. On the bodily exercises of the Great Revival during the early nineteenth century, see, especially, Leigh Eric Schmidt, Holy Fairs: Scotland and the Making of American Revivalism, 2d ed. (Grand Rapids, Mich., 2001), xi–xxviii. Mr. Beuel came to Concord March the 20. They had a publick exercise every day, & for nine nights Successively (which was the time, he continued, there). Great numbers, of the people, tarried the greatest part of the night, in the Meeting-house, & Mr. Beuel with them, sometimes, til two a-clock in the Morning. 1. That all these disorders were encouraged by Mr. Beuel, & the Reverend Pastor of the town, for they endeavoured to raise these different passions, to the highest pitch. 2. That they esteem’d those truly converted, who had these Joys, & that the others were in a damnable state. This appear’d by all their addresses to them. 3. That the greatest part, could give No rational Account, of their distresses, or Joys. 4. That many were suddenly struck, & drop’d down like persons in fits. 5. That those Under concern, imagined that the louder they screem’d the sooner they should be converted, and that these expressions of sorrow & Joy were generally affected, or voluntary. This appear’d by several instances, where there was the greatest probability of the contrary; for the persons were immediately silent, Upon Mr. Beuels speaking to them for that perpose, As he was several times forc’d to do, that he Might be heard himself. 6. That ye persons were generally Women, & children. 7. That they were indifferently affected, whatever their past conduct had been. 8. That ye continuance of their distress, was various, some remain’d under it for days, others only a few hours, or minutes. 9. That these effects Never happen’d, to any considerable degree, til the darkness of the night came on.